It all started innocently enough. I wanted to record some RAW footage using the Blackmagic Pocket Cinema 4K camera. Except, the SD card I was using was not fast enough to record RAW. 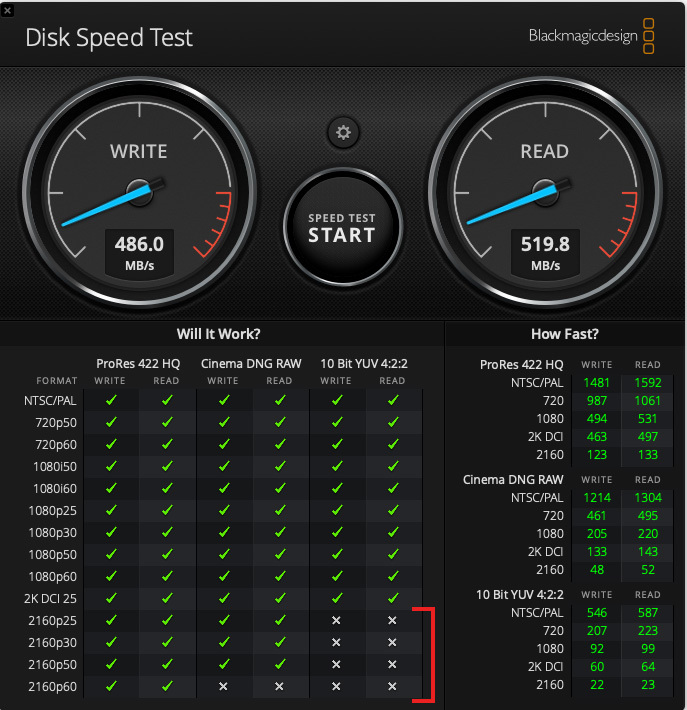 A trip to Blackmagic’s website told me that I needed to use a faster drive, preferably an SSD. They recommended several, one of which was the Samsung T5 SSD. Now that I have it, let me share what I’ve learned. 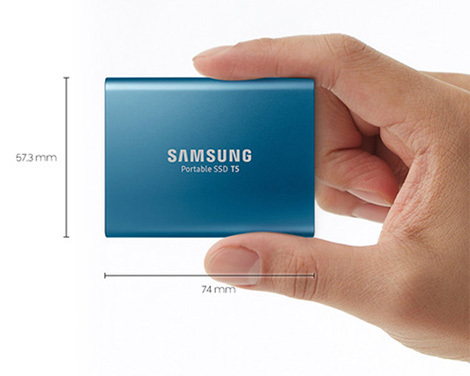 This pocket-size SSD powerhouse stores up to 2 TB of data, can be dropped with a clear conscience and delivers about 500 MB/second of data using either a Thunderbolt 3 or USB-A interface. It is small, silent, light and very fast. While not as fast as NVMe systems, it is more affordable and, like all SSDs, your data remains safely stored once power is removed. Though the system provides a utility to encrypt all data on the device, the utility is poorly implemented and unreliable. Smaller than a 1/4″ stack of business cards, this has roughly the same speed as a CFast card, stores far more and costs far less. While you can’t slide it into a CFast slot, it is small and light enough to be gaffer-taped to the side of just about anything. Think of this as a next-generation thumb drive. Because it uses an SSD, there are no moving parts inside. 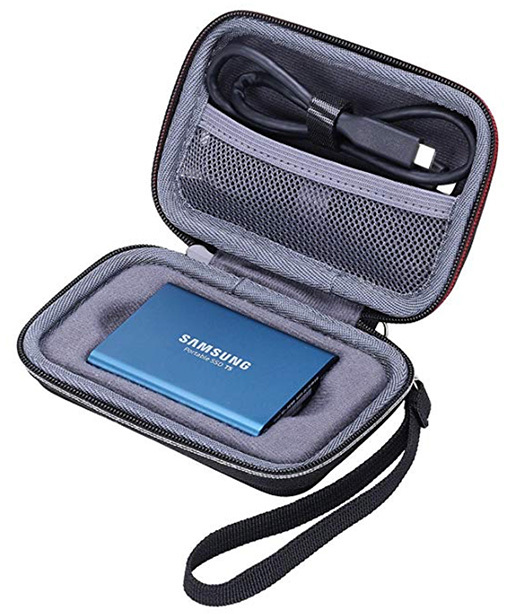 Housed in a metal case (blue or black, depending upon capacity) the system uses multi-level cell flash memory (V-NAND) which ranges in capacity from 256 GB to 2 TB. 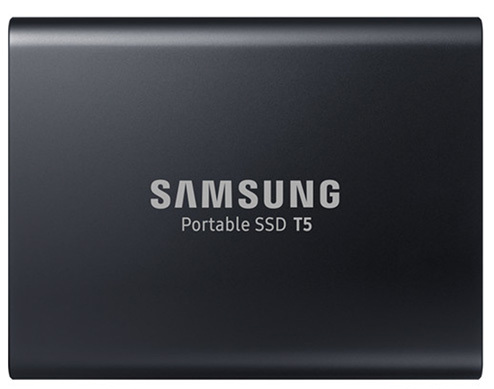 NOTE: The Samsung T5 is a “Recommended” storage device by Blackmagic Design for its Pocket Cinema 4K camera. You need more speed than a spinning drive can support. This meets both requirements. Let’s take a look at the speed. When connected via Thunderbolt 3, the unit delivers very respectable speeds of 486 MB/second write, and 519.8 MB/second read. NOTE: In almost all cases for storage, write speeds are slower than read speeds. This speed difference is is normal. NOTE: Extrapolating from the numbers, this unit looks fast enough to support UHD/24, but not any faster frame rates. I hope to test this later next week. What STUNS me about this unit, though, is its speed when connected via USB-A, as illustrate in the above screen shot! 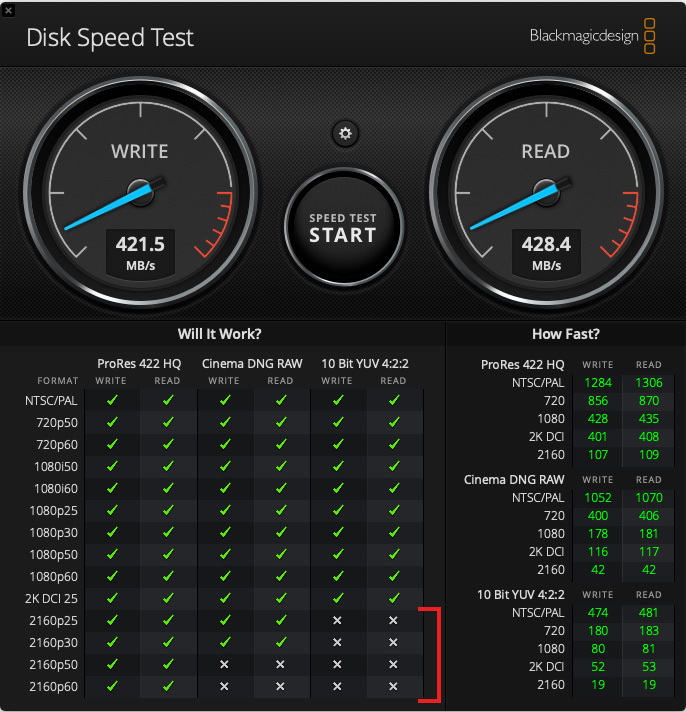 Yes, there’s about a 13% drop in write speed, and a 17% drop in read speed, but look at the speed that is left. I’ve NEVER associated 400+ MB/second with USB-A. Samsung ships a utility with the T5 that installs a system extension, which is necessary to enable 256-bit, AES encryption on the T5. I was not able to test the performance drop when encryption was enabled because the utility was unable to find a connected T5 after installation. Traditionally, performance shows down when encryption is applied. Also, if you need to run the utility later, say to change the password on the device, it is not stored anywhere you can find it. Instead, it’s in [Home Directory] > Library > Application Support > PortableSSD. 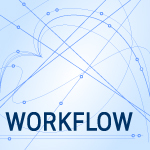 In general, this utility is very poorly executed and I recommend you NOT use it. Also, if you lose the password, you’ve lost access to all the data stored on the device, there is no way to unlock this if the password is lost. WARNING! If you do install the encryption, don’t uninstall it. The scripts did not work for me and uninstalling the software manually corrupted my operating system, requiring reinstallation. I’ve been using this unit for about a week, mostly to carry data from one point to another. I toss it in a backpack at the start of the day and don’t worry about it till I need it. For those looking for high-speed, high-capacity SSD storage, the Samsung T5 Portable SSD needs to be on your “To Be Considered” list. Just don’t use it with encryption. To make carrying it easier, I also bought the Xanad Portable Travel case for an extra $8.99 (US). What I especially like about this case is that it is, small, well-padded, and enough room for both the Thunderbolt and USB cables. I’m puzzled by your use of “USB-A” in your article. My T5s and T3s have USB-C connectors, as is pretty standard for USB3.1 protocol devices. In my vocabularly, USB-A refers to the connector type rather than the connection protocol, so it does not indicate speed. Am I missing something? My T5 shipped with two cables – USB-C to USB-C and USB-C to USB-A. The T5, itself, is USB-C, but the cable acts as a converter. So therefore the speed difference is due to the thunderbolt 3 protocol which can be active through an USB-C cable but NOT an USB-A connector or cable.. Thank you to share that drive. Do you know if it works with thunderbolt 2? While Thunderbolt 3 to Thunderbolt 2 converter cables exist, it would probably be easier to simply use the bundled USB-C to USB-A cable. You’d get about the same performance, without needing to spend more money. I have 2 of the 1TB versions, my goto Thumbdrives! The security software requires a reboot to work. If you do use it, really know the password you input. If you forget the password you have to send the SSD back to Samsung for replacement. To my astonishment, I didn’t have any reformatting tools in Mac or Windows (including some rather strong commands in Terminal) that will allow the drive to be reformatted enabling the drive to be erased and reused. So just to be super clear: If you forget your password, you have to send the SSD back to Samsung for replacement! Hi Larry, I have a 1TB Samsung T5, and until I found a fix, it was regularly self-unmounting (and sometimes remounting) several times a day. I was getting the “this disk was not properly ejected” message. I finally went to Samsung’s website, and downloaded their software. I did not use the encryption option, but I was able to do a firmware update, and since then, no unmounts! Good to know. My T5 worked perfectly out of the box – again, I am not using encryption. Thanks for adding your note.